$11.99 on itunes!Buy on Amazon! From one of the most distinguished writers of modern Italy” (New York Review of Books), a classic novel of society in the midst of a war. This powerful novel is set against the background of Italy from 1939 to 1944, from the anxious months before the country entered the war, through the war years, to the allied victory with its trailing wake of anxiety, disappointment, and grief. In the foreground are the members of two families. One is rich, the other is not. In All Our Yesterdays, as in all of Ms. Ginzburg’s novels, terrible things happensuicide, murder, air raids, and bombings. But seemingly less overwhelming events, like a family quarrel, adultery, or a deception, are given equal space, as if to say that, to a victim, adultery and air raids can be equally maiming. All Our Yesterdays gives a sharp portrait of a society hungry for change, but betrayed by war. During the period described in the novel, Natalia Ginzburg was married to the writer Leone Ginzburg. Because of his underground activities, he was interned under Mussolini’s reign, along with his family, in a restricted area in the Abruzzi. When the Ginzburgs later moved to Rome, Leone was arrested and tortured by the fascists, and killed, leaving Natalia alone to raise her three children. Do you love All Our Yesterdays book? Please share! 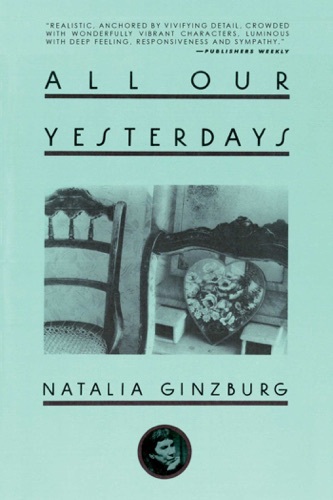 All Our Yesterdays - Natalia Ginzburg & Angus Davidson E-Book coming soon..